As the name implies, ceramic knives are made with a ceramic blade composed of zirconium dioxide (also known as zirconia). Ceramic is an extremely hard material: ceramic has a hardness of 8.2 Mohs, whereas steel is only 5-6 Mohs. Diamond, at 10 Mohs, is the only material hard enough to sharpen ceramic knives. Do Ceramic Knives Need to be Sharpened? Are There Risks Involved in Sharpening Ceramic Blades Yourself? Conclusion: Are Ceramic Blades Worth the Fuss? Because of how hard ceramic is, these knives can get a much sharper edge than traditional steel knives. Ceramic knives can also hold their edge much longer than steel, so you don't need to sharpen them as often. Ceramic is a very lightweight material, so you may mistake it for plastic the first time you pick one up. Since it’s a non-porous material, ceramic blades are much easier to clean than steel, and they don’t rust or absorb smells. Since ceramic is so hard, it’s also very brittle, which means your ceramic knives will be fragile. Ceramic blades don’t bend or flex like their steel counterparts, and if you try, you’re likely to snap the blade in half. This brittleness means the edges are more likely to chip, and if you drop a ceramic knife, or accidentally hit it against something, there’s a good chance it will break. We recommend that you only use ceramic knives to cut softer material, such as fruits, vegetables, cheeses, and boneless meats. Despite the misleading commercials that would have you believe otherwise, ceramic knives don’t stay sharp forever. After months of regular use, your ceramic blade will chip and lose its edge. You can’t use normal knife sharpening tools, though, because of how hard ceramic is. The only material hard enough to sharpen a ceramic knife is diamond. There are three types of tools available for sharpening your ceramic knife by yourself, or you can take it to a professional. We’ll cover the three primary ways to sharpen ceramic knives yourself: a diamond whetstone, an electric diamond knife sharpener, or a diamond sharpening rod. You can find diamond whetstones if you don’t feel like looking for a specialty blade store. We recommend the DMT W6EFC set of three diamond stones with varying levels of coarseness: extra-fine, for polishing an already-sharp edge; fine, for sharpening a duller edge; and coarse, for shaving down chips and imperfections. You should wear a set of heavy-duty work gloves when sharpening any knife, but especially ceramics, as they get ultra-sharp. You can also find cut-resistant gloves designed for use with knives and other sharp tools. Fold up a large towel and place it on your work surface, then put your whetstone on top of it, with the diamond side facing up. This will keep your stone from sliding around on the table. You don’t want to put too much lateral pressure on your ceramic blade, because it’s surprisingly easy to snap. Use your dominant hand to grip the handle, then use the fingers on your other hand to guide and support the blade. Hold your blade at an 18- to 20-degree angle so that it’s almost flat against the whetstone. Swipe the blade across the stone from the heel (the base, where the blade meets the handle) to the toe (the tip). For a moderately dull knife, you’ll want to do this six times per side. While wearing your cut-resistant gloves, use a soft towel to wipe away any excess metal filings. Rinse the blade under warm water and then gently dry it before using it or putting it away. The best electric knife sharpener for ceramic is from Kyocera, one of the top manufacturers of ceramic knives. You can get the Kyocera Advanced Ceramic Electric Diamond Knife Sharpener on Amazon. Use one hand (preferably your non-dominant hand) to steady the electric knife sharpener on a table. Use your free hand to hold the ceramic knife, then pull it through the slot in the electric knife sharpener. Move slowly, and slide it through as many times as you need to, remembering to keep your other hand on the sharpener at all times. Test the blade periodically by slicing a piece of paper or something soft like a tomato to make sure it’s sharp enough. Rinse your blade thoroughly under running water to remove any leftover shavings. Gently dry the knife with a soft towel, then store or use it as desired. Be careful when shopping for a sharpening rod. You'll see lots of them advertised as "ceramic knife sharpening rods," but that doesn't mean they'll work for you. That name refers to the material of the rod, which is designed to sharpen softer blades like steel. You'll need a diamond sharpening rod, like the DMT D2SF 12-inch Diamond Steel Sharpening Rod. Just like using the whetstone, you’ll need to wear heavy gloves when using a sharpening rod. Grip the handle of the sharpening rod with your non-dominant hand. 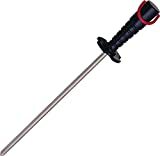 You can hold the rod vertically, in which case you’ll rest the tip on the table with the handle sticking straight up; or if you prefer, you can hold it horizontally, with the tip of the sharpening rod pointing away from you. Holding your knife at about a 20-degree angle from the sharpening rod, strike it against the rod in one smooth motion from heel to toe. Repeat this motion at least three times on each side, until the blade is as sharp as you want it to be. Use a towel to wipe away any leftover metal filings gently. Use warm water to thoroughly rinse the blade, then dry it gently with a soft cloth. Any time you’re working with sharp edges, there’s some risk involved. As long as you follow all safety precautions, including the use of cut-resistant gloves, the risk to your body is minimal. There is some risk of damaging your blade, though. As we mentioned before, you can't apply too much lateral pressure to a ceramic blade, because they're too brittle. Even just a little bit of weight can be enough to snap the blade in half. If you have experience sharpening steel blades, it'll take some adjustment to transition to ceramic blade sharpening. For one thing, ceramic blades don't flex at all, so you need to use significantly less pressure when striking your blade against your whetstone or sharpening rod. Steel knives also form a bur once you've sharpened them as fine as they'll go; ceramic blade edges will keep getting finer and finer until they break off. Now that you have an ultra-sharp ceramic knife, you might be tempted to use it as a replacement for all of your dull steel knives. Unfortunately, ceramic blades aren’t as versatile as steel blades, so you can only use them on softer foods and materials, like fruits, some vegetables, soft cheeses, and boneless meats. Never use a ceramic knife on a glass cutting board. You should only use plastic, wood, or bamboo cutting boards with a ceramic blade. Don’t use the flat of the blade to smash garlic or herbs, because the pressure you’ll be putting on the side of the knife can cause it to snap. As tempting as it will be to use your razor-sharp ceramic blade for projects outside of the kitchen, don’t ever use it for anything other than soft food. If you try to use it to cut open boxes, plastic packaging, or other household items, you’ll almost certainly ruin the knife. Once you're done using your knife, you should wash it immediately, rather than just tossing it into the sink. We really can't overstate how easy it is to chip or break a ceramic blade, especially if it bangs up against the side of the sink or any dishes. Hand-wash it with warm water and mild detergent. The non-porous ceramic doesn't absorb food smells or bacteria, so you don't need to scrub it. Dry the knife as soon as you're finished washing it—though the ceramic material won't rust or corrode from moisture, there's a higher chance of it sliding off the counter or out of your hands and breaking. Store it in a safe place, such as a bamboo or foam knife block. Some ceramic knives come with a storage container as well. Any high-end kitchen knife needs to be babied, to a certain extent. Ceramic is more fragile than steel, but it also has the advantage of being rust-free, as well as extraordinarily sharp. For certain tasks, like thin-slicing fruits, meats, or cheeses, the fine edge of a ceramic blade can't be beaten. If you’re too nervous about the idea of sharpening a ceramic knife on your own, you can find professional knife grinders who will do it for you. Kyocera offers sharpening service for some of their high-end ceramic knives, as do other popular manufacturers. The best way is to find and support a local shop, though, as they’ll have real artisans on staff who will take great care of your ceramic knives. If you're willing to put in the work to take care of them, we believe ceramic knives can be an incredible investment. We hope these sharpening and care instructions help you get years of use out of your ceramic blade.